Salesforce.com is an essential tool for managing your sales pipeline. The CRM solution helps sales teams better manage contacts and track opportunities. To get even more value from Salesforce, connect to AnswerRocket, our self-service analytics platform. Click the video above to see AnswerRocket in action using Salesforce data. Natural language search: Type or speak a question using plain English – even terms specific to your company or industry – and AnswerRocket understands. Answers are returned within seconds in the form of data visualizations or tables. Ask: “What are the top open accounts by revenue without activity last week?”. 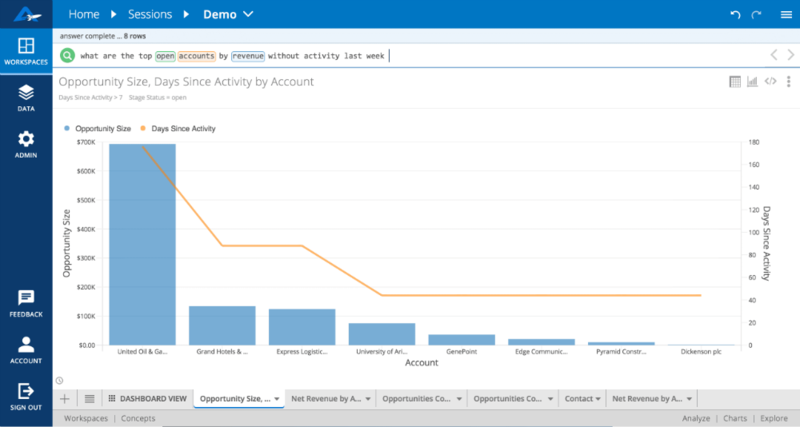 Your response will be a combination chart showing account name, opportunity size, and days since last activity. Modify the question by asking “What are the top open accounts by net size and stage?”. The data instantly refreshes into a heat map of accounts, opportunity stages, and net revenue. Unlike other business intelligence tools, no advanced technical training is required. If you can use a search engine, you’re ready for AnswerRocket. Combining Salesforce data with other datasets: AnswerRocket lets you ask questions across multiple data sources. You can look at your sales leads along with details from comparable companies that are already your customers. That lets you study sales patterns and forecast potential future revenue. AnswerRocket can connect to a variety of data sources – ERP, transactional, accounting, and more. To see how you can combine your Salesforce data with other datasets using AnswerRocket, request a custom demo. See how AnswerRocket can enable your team to make better, faster, data-driven decisions by simply asking questions.